Next Car Game teeters somewhere between being a brilliant title for a game and a really terrible one. It’s sillier than plain old Forza Motorsport, and less like it was devised by an amped up teenage boy, like Need for Speed. Lamentably, there is no such game as Next Car Game anymore. The name was temporary, and the demolition racing game is now going by a new handle, which the community helped developer Bugbear pick: Wreckfest. Oh dear. 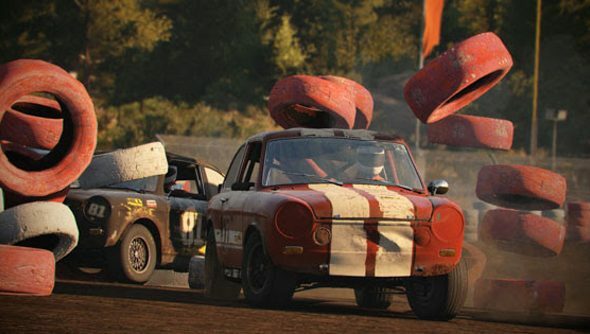 Along with the new name, Wreckfest has grown some new limbs. There’s 18-player multiplayer now, covering all the modes from deathmatch to racing. Surely you have at least a couple of chums who you’d love smash with a car. The European coupe joins the roster of cars, too, which Bugbear describes as a “beast difficult to master but a real contender on both racing and derby matches”. You can take her for a spin on a new two-for-one track, Speedway. It’s an oval circuit with a figure 8 track inside it. Wreckfest is in Early Access at the moment.